It has always been true that, if you want a straight answer to a straight question, ask an Australian. If you don't believe me, have a read of Mark Webber's thoughts on McLaren's disastrous pit stop and the storm that resulted from it. Every team does it - bringing two cars in at the same time and inevitably delaying one driver. At the Nurburgring both David and I lost our last qualifying laps because the team weren't organised in that kind of situation and we didn't get out in time. Well dang me, Mark, you're right - I remember that incident. But tell me, how come the stewards didn't intervene to see fair play between you and David? I just don't understand what the stewards were doing. One team drops the ball, ruins their own guy's chances of getting in a final lap and the team get punished? How does that work? It happens to teams all the way down the grid but they don't get their points taken away. It's just baffled me. But you're an F1 driver. Surely you must understand how these things work? When you go to such extreme margins and try to leave the pits with say a minute and 30 to go when you know it takes a minute and 25 to do a lap, you're always taking a risk, and sometimes you screw yourselves. I just don't understand the points penalty though. People have tried to explain it to me but I just don't get it. You screw yourself over and then get penalised for it. It's crazy. I have to agree with you, Mark, but the fact is it has happened. And now everyone is saying that one of the two McLaren drivers will leave, perhaps even before the end of the year. Can you see that happening? The relationship between Lewis and Fernando looks pretty tense at the moment. But I don't see that it's such a big deal really. Prost and Senna hated each other but they still won loads of races in their time as team-mates. I've never really had a great relationship with any of my team-mates. Not just in F1 but in my whole career. It's not that we hated each other, I mean I used to talk to them, but it's not like we were friends or spent time together off the track. That's just the way things have to be. F1 is a competitive sport after all and we all want to win. It's just that they're both fighting for the championship so it's a bit more intense. So it's just business as usual? You reckon Ron will patch it up and they'll be able to continue, at least to the end of the year? It's getting like Prost and Senna. They only lasted two years together at McLaren and I don't see this one lasting any longer. I don't know if that means Fernando or Lewis leaving the team. It will be interesting to see. Hedging your bets a bit on that last one there, Mark. Still, I can see why - we were all a bit surprised when Lewis finally showed us his nasty side and Fernando does have that hot Spanish blood that makes him a bit unpredictable. I guess we'll just have to wait and see. Maybe we should have a few more Australians in F1. There would certainly be a lot more straight talking if that happened and we might not have debates such as Pitpass' one asking whether the fans are ready to give up on a sport that has descended to such petty arguments and interference by the governing body. We now have a three-week break before the next Grand Prix and this is a good chance to take stock and digest what has happened in the season so far. We can also hope that the powers that be will realize just how bad things have become in F1 and start listening to the good sense spoken by those who care most about the sport. It's a faint hope, I know, but Bernie at least shows the occasional flash of understanding and might be able to knock some sense into a few heads. After all, he's the only one trying to get Spyker and the customer car teams to reach agreement rather than go to court. Ah, you'd forgotten about that one in all the recent kerfuffles, hadn't you...? So the people who watch F1 can't understand the penalty, and now it would appear the people who drive in F1 don't understand it either - so it's just the people who run F1 who have any idea what is going on! Looking forward to DC's view on things when his column appears on ITV.com soon - he's another who normally says what's what. Actually, Craig, I think the people who run the show are the ones who have no idea what is going on. Certainly, they seem to be completely unaware of the damage they are causing to the sport and, if they continue to behave as though they have the right to intervene in everything in sight, they will destroy F1. David is always worth listening to, I agree, and he's one of the few who is prepared to risk the wrath of the FIA when the truth needs speaking out. He's one of the good guys, definitely. Webber and Wurtz for president! (of the FiA of course). I wanted to bring up one last point from this past weekends qualifying. How come, with all the money being thrown around, every time a qualifying doesn't go as planned there isn't a contingency plan? Massa failed to make it to Q3 because of a lack of fuel?! Did no one think of this? Can't the Ferrari afford to have a little extra fuel on board during the Q2 session? Time wasn't an issue, he could have gotten another lap in even if they took the time put another couple liters (or litre? damn you people) of fuel. And what of the McLaren fiasco. I would think there would be a better way to go about that. If it was the teams decision to make sure that Alonso got the extra lap (and most likely the pole) then couldn't they find a better way to hinder Hamilton? Couldn't they just make him not run another lap? Correct me if I am wrong but I think it was Prost, who in an hour long qually session set such a fast lap that he changed to his street clothes. He told reporters "if someone can beat that time they deserve pole." He was done for the day. McLaren could have just parked Hammy and told the press that they thought that Alonso would not be able to beat his time and they parked Hamilton to "save" his engine for the race. "He blatantly disobeyed orders and he was subsequently punished." Wha-la! A 1-2 starting grid for the silver team, they get to collect points in the Championship, Alonso gets what he wanted and no one would assume he was to blame. And to top it all off Ron Dennis could continue to "build his character" as a "take no nonsense and just do what I tell you" type. Why hasn't anyone hired me yet? No doubt the teams try to be as flexible as possible but not all eventualities can be taken into account. That's the definition of a foul-up, after all - something you hadn't thought of before! As far as I can work out, the Ferrari crew entirely forgot to refuel Massa's car and his engine died before he could get out of the pitlane. That tells us how finely they calculate these things and, presumably, they have to do so because every tiny fraction of weight can make a difference to the lap time. It seems ridiculous to me too but, when you consider that grid places are separated by thousandths of a second, the teams have to be that accurate with their calculations. Yet another good reason to scrap all the fuel regulations and let them have an hour to set a good time without restrictions. I think I made a point about the inflexibility of McLaren planning in an earlier post - it was fairly obvious that Hamilton's naughty took them off guard and they were a bit ham-fisted in working out a strategy to cope with the new situation. I would agree that what they decided to do wasn't the best way of handling it. Having said that, however, I think they cannot be blamed for not anticipating Alonso's response to the situation. Unlike everyone else, I don't think it was finely calculated in the Spaniard's mind; I think it was a sudden eruption of temper in which he realized he could get back at Hamilton by making him wait. I doubt that he worked out just how long he had to stay there to allow himself a lap while denying his team mate one - it just happened that way and so looked premeditated. Alonso does this every now and again (remember how he suddenly blew off steam at the Renault team last year, claiming that they weren't giving him enough support?) and I put it down to good old Latin blood boiling over. What was surprising about the incident was that it happened while he was in the car - normally he keeps his temper tantrums between races and then looks ice cold in the car. But I suppose it was the fact that the car was not moving that allowed this particular moment of rage to engulf him. And then Ron could have given Hamilton a good talking to after qualifying and sorted out some sort of compromise to keep Alonso happy. Alonso ruined any chance of that happening by his moment of anger, however. After reading the pitpass article, it isn't just the familiar complaints about F1 that reach me, it's the way-too-familiar threat to abandon ship that I've read and heard in everything I've ever done. Of all the people that say they're leaving, I'd guess that half of them mean it, and one-quarter of them actually leave the pursuit in question. We know that Bernie and Max aren't accepting the gift that is the complaints appearing throughout the internet, or else there would be a more obvious response available to be read, which begs the question of where the money really comes from. I have heard similar quips that the National Basketball Association will someday play all games in an arena with no bleachers, only multithousand dollar (per event) entertainment boxes, and that "fans" will only watch the events on pay-per-view television. The other reason it is way too familiar to me, is that a majority of the people I've had tell me, "I'm not shopping with you anymore," while I've worked in retail business either had accounts with few transactions and therefore, rarely shopped with "us" in the first place, or after a month, you can see no deviation in their shopping habits whatsoever. Again, the customer that is not coming back is the one that leaves you and says nothing at all. What of the people that were spectators in the 80's and 90's and have simply lost interest and gone on to something else? In reading through the reams of replies to Pitpass' question, Chunter, I was struck by the fact that just about everyone seemed to be missing the point. The question was "Is F1 alienating its fans?" and yet most of the answers majored on long histories of individual reactions to the sport. I guess we are all too self-centered to take a step back and look around us. Were we able to see viewing stats, I'm quite sure that we would find your observations to be true. Those who are really going just go. But we should remember that a complaint is only a gift when it is acted upon. Seems to me that the FIA have had plenty of gifts over the years but they never really hear them. I saw some figures a while back that indicated F1 was going down in popularity (TV viewing figures in other words) - in fact, I think it was in the last FIA survey of fans' opinions. Bernie must be aware of those stats and should be taking note. Perhaps that is what causes the general paranoia about ensuring a "good show" and the resulting rules and regulations intended to improve the entertainment value but merely but make things worse. The more I think about this, the more depressed I get about the future of F1. It is sometimes called a circus and, increasingly, that is exactly what it becomes. No need for a bidding war, I will settle with free tickets to one race, that should be about a years salary! As much as they are alienating their fan base, it wouldn't take much to turn it around. F1 fans are like the girlfriend who always says there not happy but is too afraid to actually leave. The fear that as soon as we actually do leave things will get better. I believe that Bernie (and the FiA) will change. Bernie's eyes seem to see only in green. He will continue to peruse countries that are willing to pay by $'s for a race, but ultimately he is nothing without his faithful TV viewers. Actually he is nothing without his sponsors, who in turn are nothing without us. But lets face it, no matter how much we hate the direction of the sport, we continue to watch it. Don't we need to change before the sport does? I'm not sure what type of salesman you are but if you were selling overpriced cars and people kept buying them would you want to lower your price or be more customer friendly? Businesses evolve as the customer changes. All true, Dan. We get the F1 we deserve! A nice read above but wandered a bit from the musings of Mark Webber; Let's back up and start again. Here's the first of Webber's remarks I'll comment about: "...chances of getting in a final lap and the team ..." this is where I get annoyed, the teams are still in the mind set of ONE HOT LAP, from the old days. They manipulate and fiddle and fool around and then ROLL THE DICE and how many times have we heard them whining I was blocked on my HOT LAP? Each car has 15 minutes to record their best lap and they squander about 12 minutes needlessly. And how about this Webber quote? "I've never really had a great relationship with any of my team-mates. Not just in F1 but in my whole career. It's not that we hated each other, ..." Whoa! Does anyone remember Anotnio Pizzonia...our boy Mark publically HATED him and said so on how many ocassions? And when he moved to Williams he wanted a teammate he could "blow away", those are his words! Mark is no standard bearer in my book although over time he's matured a little. 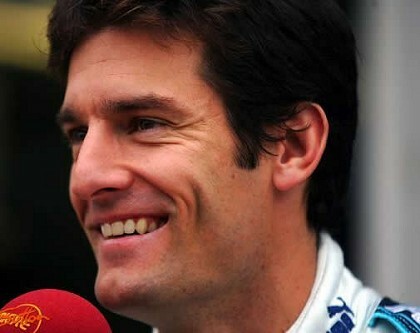 Here's another Webber quote that seems a bit much: "I don't know if that means Fernando or Lewis leaving the team. It will be interesting to see." Lewis leaving McLaren? IMPOSSIBLE ! Hamilton is a expensive McLaren INVESTMENT and he's just started to produce dividends, McLaren won't let him go no matter how much trouble he causes. As much as I disagree with Webber's remarks Clive did close the article with some sound judgement, "...hope that the powers that be will realize just how bad things have become in F1..." that would be MadMax and company but looking at what they have already planned for the future ....... I can't take much comfort in that thought AND "Bernie at least shows the occasional flash of understanding and might be able to knock some sense......" small flashes and not ocassional enough ! F1 is at an ebb right now, it's pretty bad, but packing up and walking away isn't going to solve anything. Always good to hear your thoughts, Number 38. And good to her that you intend to survive! There are some out there who are ready to give up on F1, it seems. I used Mark's thoughts for this one because I thought he expressed rather well the general bewilderment at the antics of the stewards, not only just in this case, but in so many other incidents in recent years. If even the drivers find it hard to understand some things, what chance have the fans? As to whether Alonso or Hamilton will leave McLaren, we can only wait and see. My own thoughts are that both will stay but Ron Dennis will have his hands full in preventing all out war from breaking out between the two of them. Perhaps he is doomed to fail in the end.